Born into a family of painters, including his father Giovanni Antonio Aspertini, Amico was a forerunner of Mannerism from the Bolognese School of Painting. He was described by the biographer of the Italian Renaissance, Giorgio Vasari, as a half-insane master who produced works rapidly in an eccentric style. Vasari had said he produced so quickly that Chiaroscuro, a bold contrast between light and dark, was spilt with chiaro (clear) in one hand and scuro (dark) in the other. He studied under the Bolognese masters Lorenzo Costa (1460 – 1535) and Francesco Francia (1450 – 1517), and was considered a gifted prodigy. His complex frescos and eclectic façade decorations were a unique style under his more traditional influences. 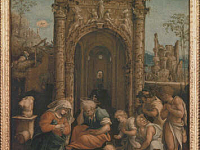 Most prominently from that of the Perugian painter Pinturicchio (1452 – 1513), whose works were sometimes mistaken for Raphael’s (1483 – 1520) earlier work among other similar painters. Raphael’s elegant works, produced in a gentle, graceful manner were an influence on Bolognese painters such as Francia as well. One of Aspertini’s earliest works was a piece done in tempura on wood, titled, Profile of Hero, from 1496. He lived in Rome for a short while until returning to his home of Bologna in 1504. That same year, when the Oratory of Santa Cecilia in San Giacome Maggiore in Bologna was restored; Aspertini worked with Costa and Francia on the frescos. He went on to paint other frescos in the city of Lucca in San Frediano during 1507 – 1509 and also in the Chapel of the Cross in the Basilica di San Frediano. After 1510 and for the next twenty years of his life he continued to paint some, but took to sculpture. Gaining much respect as an artist and sculpture, he was selected to decorate an arch for the entry into the city of Bologna for Pope Clement VII and also Charles V’s entry into the city in 1529. He was only one of two artists selected to create these pieces, and they secured his reputation in Italian art history. Though, as a scholar of ancient art, Aspertini used motifs from the works of antiquity in his paintings and drawings. His early sketch books from his time in Rome have been an important contribution to contemporary knowledge of ancient art. Many of Aspertini’s façade decorations and altarpieces have not survived, but his eccentric style is well remembered in Vasari’s record of him. Vasari quoted Aspertini as saying that all his Bolognese contemporaries copied the work of Raphael. So perhaps the artist aspired to transcend such graceful technique into his intensely charged expressions.